Evernote version 3.0 launches for new iPhone OS - the best brain replacement for mobile phones yet! 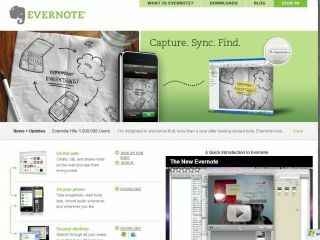 Following the launch of Apple's iPhone 3.0 operating system this week, the handy e-note-taking service Evernote has upgraded its service to make use of a number of new features. Which means one thing. There is now even less reason to rely on your own human brain for remembering stuff! "Evernote 3.0 is a big jump for our App Store application," says Phil Libin, CEO of Evernote. "Capturing and finding notes is now infinitely more intuitive. I look forward to seeing how our users will react to this update, especially those with the new iPhone 3G S, which is the perfect device for Evernote thanks to its improved camera." Evernote lets you create notes, take snapshots, record audio memos, and search through any content created on your iPhone or iPod touch, desktop or the Web, with its cloud-based sync functionality. The new functionality in Evernote 3.0 makes use of the new iPhone 3.0 features such as the Clipboard, MapKit, CoreData, and more. "MapKit was used to create the new Map View, which plots notes on a map and filters them based on map zoom level," Evernote informs us, adding that, "CoreData allows the application to display a smooth-scrolling list of thumbnails for tens, hundreds, or thousands of notes without required the user to reload the page." In addition to providing enhanced functionality on the iPhone and iPod touch, the new capabilities in the iPhone OS 3.0 software make it easier to share code between the iPhone and Mac OS/X versions of Evernote. This allows both the mobile and desktop software to be developed more quickly and economically.